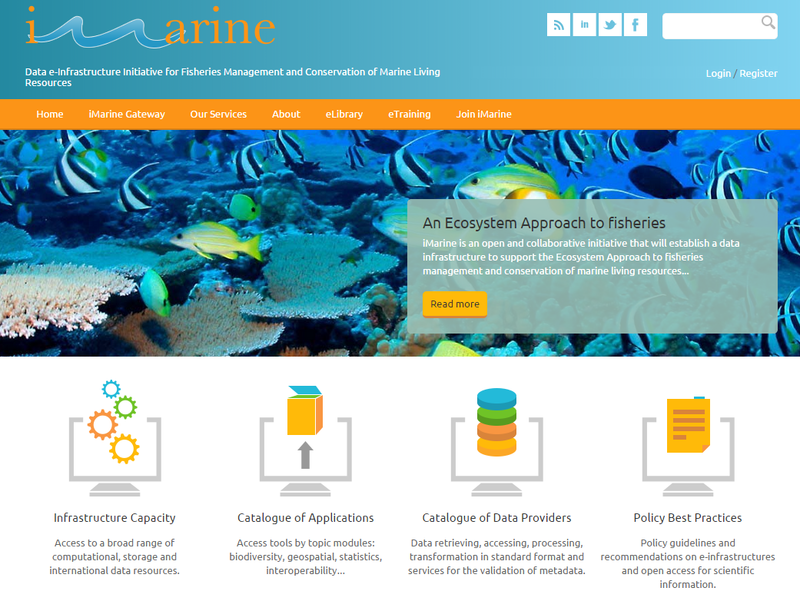 iMarine is an open and collaborative initiative aimed at supporting the implementation of the Ecosystem Approach to Fisheries management and the conservation of living marine resources. The ultimate goal of iMarine is to contribute to sustainable environmental management with invaluable direct or indirect benefits to the future of our planet, from climate change mitigation and marine biodiversity loss containment to poverty alleviation and disaster risk reduction. iMarine provides an e-infrastructure that facilitates open access and the sharing of a multitude of data, collaborative analysis, processing and mining processing, as well as the publication and dissemination of newly generated knowledge. This is a complex process because it requires coordination with many actors and initiatives across different scientific and operational domains. It is also important to tackle data heterogeneity while relying on a multitude of resources and technologies, some of which are not yet ripe or powerful enough to meet the given requirements. iMarine is co-funded by the European Commission, DG Connect Unit, under Framework Programme 7 and involves 13 international partners. Infrastructure Capacity: Access to a broad range of computational, storage and international data resources. Catalogue of Data Providers: Data retrieving, accessing, processing, transformation in standard format and services for the validation of metadata. Policy Best Practices: Policy guidelines and recommendations on e-infrastructures and open access for scientific information. iMarine Virtual Research Environments: The iMarine virtual research environment is a distributed and dynamically created environment, where the data, services, computational and storage resources are governed by dedicated policies. These services and resources are assigned to users via interfaces for a limited timeframe at little or no cost for the providers of the participatory data infrastructures.